having trouble going down the stairs when I start w my left leg which then makes you bend the right foot (bad foot) foot feels so sore inside middle of foot. Scars and skin are very sore and tender. Waling some without the boot. Still have swelling issues. Getting a compression sock in a day or so. PT starts this WED. Still have some swelling and have 1/2 the stitches in to hold it together. 1 More week and I can start to try and walk a little w the boot. My right side of the ankle is still swollen and tender, same as it was before this second surgery I’m hoping this will get better. Ever since the first surgery in Feb to remove the bone spur I have had the swelling on the right side of ankle? Time will tell I’m hoping for the best. Friday- Cast & Stitches Out!!! A couple more days and this cast comes off and my stitches out. I can hardly wait. Little worried that I still have swelling though. Hoping to be able to get into the boot and start walking slowly. Anyone have swelling while still in the cast? If I keep my foot down too much it swells. Stitches out this Friday and Cast off and into a boot. First Surgery Feb 23rd Had Heel Spur (haglunds deformity) Non weight bearing for a few weeks, then a boot and PT. Foot was more painful and had this pulling felling from bottom of scar an up about 4 in. Right side of ankle would swell and twinge and hurt the more I walked too. After 4 months of more steroids, anti inflammatory and then a cortisone shot and cream… nothing helped. PT was torture. Podiatrist was not sure what to do with me… so he mentioned a second opinion and I went for it. Now July 6th I had surgery with an Ortho Ankle and Foot Surgeon for Tendon debridement and FHL Transfer. 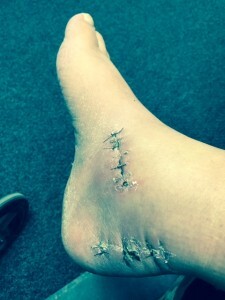 She said the tendon did not heal from the first surgery months ago etc…. So, Here I am Day 7 Post OP. I’m hoping for the best. Pain not too bad but need leg up a lot or it swells up… use ice too. Back at work in the office w foot raised. 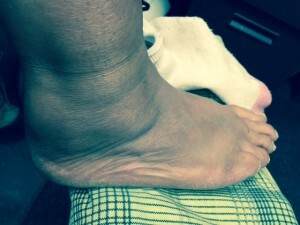 My right side of ankle still hurts some…. the stitches hurt, I’m told I have 2 incisions now on the left side of the foot. Non Weight bearing for a month….. 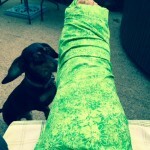 I get the cast off July 24th…. then see what happens… back the boot again and PT I’m assuming I just want to be able to walk with so much pain. UGH… You take it for granted when each step out hurts like hell. I hope this surgery will help me……. Wanted to give you all a little history as I progress. Oh and I’m 54…. so does age matter really on healing…… OLD AGE is not for Sissys….but I want to be mobile and enjoy my life again. .
mariejones98’s AchillesBlog © 2007 All Rights Reserved. sumenep 1.0 made by Nurudin Jauhari.